Fulterer is an industry leader in specialty slides for pullout pantrys. Fulterer is an industry leader in specialty slides for pullout pantries. With weight capacities from 150 lbs. to 350 lbs. and lengths starting at 16" and going all the way up to 44", you are sure to find the pantry slide to fit your needs. A patented installation system makes installation and adjustment quick. 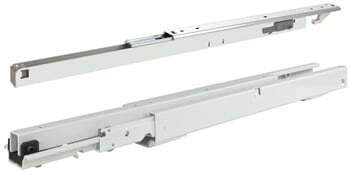 FR777 model is designed for large full height pantry pull-outs, up to 450 lbs. 16" to 44"